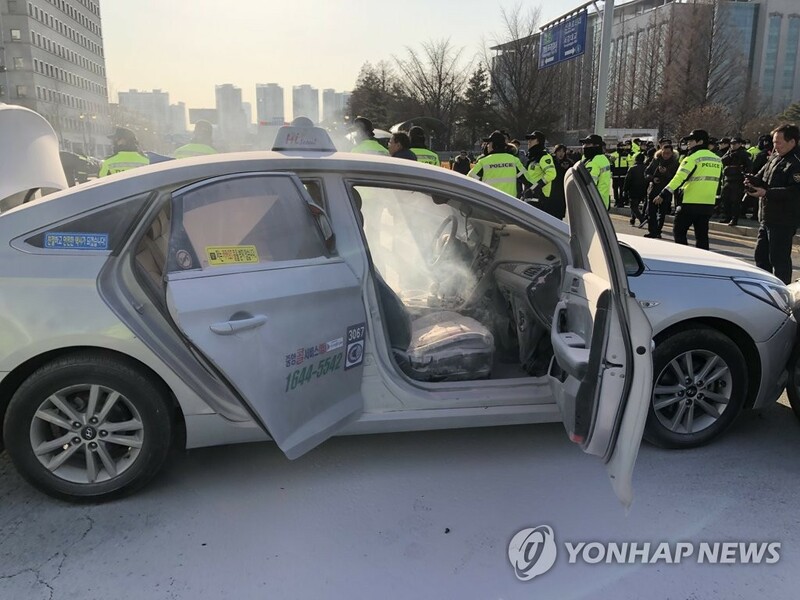 SEOUL, Feb. 11 (Yonhap) -- A taxi driver set himself on fire in his cab Monday in another apparent suicide attempt in protest at a commercial ride-sharing service. The 62-year-old, identified by the surname Kim, set his seat in the taxi ablaze in front of the National Assembly in western Seoul at about 3:50 p.m., after he was denied entry to the parliament. The fire was put out by rescue officials shortly afterwards. He suffered burns to his face and was sent to a nearby hospital. Hospital officials said the patient was undergoing treatment in the intensive care unit but faced no immediate threat to his life. The police believe the driver took the extreme measure to protest against the proposed launch of a ride-sharing service by Kakao Corp. as they found what appeared to be a suicide note denouncing the ride-sharing service inside the taxi. Kim is the third taxi driver in about two months to set himself on fire in protest against the ride-sharing service. Kakao temporarily suspended its ride-sharing service last month after a 57-year-old taxi driver, identified only as Choi, set himself on fire, also in front of the National Assembly, on Dec. 10, followed by a 64-year-old taxi driver taking similar action on Jan. 9. Both Choi and the second driver, identified as Im, died due to self-inflicted burns.